Banana peels, eggshells, coffee grounds… You’re probably thinking about your trashcan after breakfast, huh? Well that’s good, because that’s exactly what I had in mind. Most of us are looking for ways to be greener and friendlier to the environment. But everyone’s looking at the dinner table and not what goes into the garbage while making dinner. It turns out that one of the most efficient and convenient ways to get rid of rubbish and be green all at once has just been sitting around in the trash. Composting is a great, affordable and easy way to save the planet! Almost anything can be composted (including pet hairs, fruit peels, pencil shavings, nail clippings, paper napkins, and tea bags). After you’re all done getting rid of your garbage, the compostable material can be used as soil to grow plants! So instead of filling landfills with garbage, you’re helping line public parks with trees and flowers! Nothing is thrown out. Or actually, EVERYTHING is thrown out. There are lists and lists of compostable items. Pretty much anything organic can be composted. So food, hair, plants, newspaper, etc. can all be tossed in. HOWEVER, be careful when composting dairy and meat products because they develop odors and attract pests. Also, stay clear of plastics and such in the composting bin (they will render the compost unusable). Bigger is better. Usually when composting, a bigger pile will allow heat to build up and more efficiently break down the waste…although you can go too big. A 2 foot by 2 foot pile is about the right size. Let it breathe. Allow the pile to breathe and aerate. You need to make sure that you turn the waste every once in a while so that the pile gets enough oxygen to break down well. If the compost pile is too dry and not aired out, it will have no moisture to keep the composting process going. A little bit of everything. Make sure you don’t have too much of one product. If you do, it may make the composting process slower. It’s harder to break down the waste with an abundance of one single product. You need to have “browns” and “greens”. Browns are the dead plant materials, like dried leaves and straw. Greens are fresh plant materials, like vegetable scraps and coffee grounds. Location, Location, Location. It’s probably better to put your composting pile outside. But if you live in a dorm (which most of us do) you can always create a small pile in a trash bin. There are plenty of composting bins on the market, but you can make your own! If you tend to your compost pile there should be no smell and no pests. Your compost should be done between 2-3 weeks. Then you can bring it to your community’s compost drop off! 1. Drill 1/2-inch diameter holes in the bottom and sides of a plastic garbage can. 2. Place a brick in the bottom of a larger garbage can, surround the brick with a layer of wood chips or soil, and place the smaller can inside on top of the brick. 3. Wrap insulation around the outer can to keep the compost warm and cover the cans with a lid. « prev | You’re Invited: Oktoberfest! 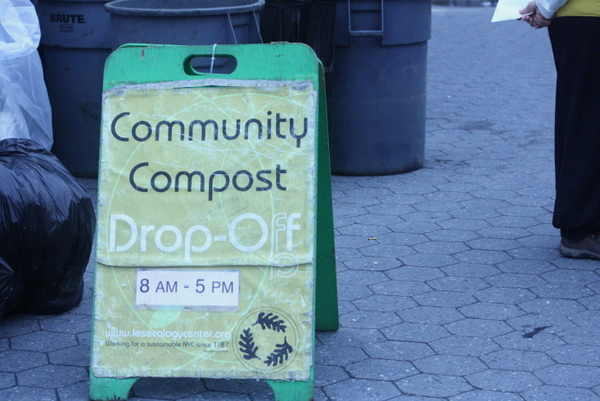 Happy Composting…sounds like it could be a holiday.